SA Champs - Play Cricket! Welcome to the home of SA Champs. Players must have played 3 games in 2020 for the team. Players must have played 10 games for the team in 2019. No special dispensation to be given. Teams were placed into 5 POOLS of three teams, with one seed per pool based on SA Team Rankings on the 10th September 2015. 2015 SA Champs only saw 15 top teams in SA taking part, by invitation only, based on the team's performance over the last 12 months. This year™s edition also saw a team from our newest franchise Kathu taking part, the Kalahari Ninjas who did well reaching the quarters of the main cup. Close games were recorded and even a draw between On The Field and Fireballs in the first round. 25 September 2015 were the semi finals. This saw On The Field from Joburg taking on Cobras from Alberton in the first semi. Cobras won the toss and batted first putting a score of 141/7/20 on the board. On The Field chased the score but not good enough. They ended up on 133/8/20. Erasmus Eben of Cobras bowled well taking 2 wickets from 4 overs and only conceding 14 runs. On The Field changed tactics but they seemed not to have worked for the them. Usually Bjorn and Wes Briggs open for them and these two always make runs for them. Instead Werner Snyman and Jason Jacobs opened for them and their run rate was slow as expected than when the Briggs open. Wes came on third but didn't make runs enough to carry the team through. Bjorn Briggs came fifth but was unfortunately ran out at the non striker end. The second semi saw the top two ranked teams in South Africa clashing,Rebels ranked 1 and Bloem Rebels ranked 2 and also the defending champions.Rebels won the toss and chose to bat first putting a score of 130/6/20. Superb performance by Gilson Bruce of Rebels who batted like a demon to try and carry his team through to the finals scoring 69/49. Unfortunately this didn't work well. Bloem Rebels managed to chase the score in 18.1 overs scoring 131 and only two wickets fell for them. Marius Swart their opening batsman scored 50/30 and he did set a steady tone for his fellow batsmen to cruise through to the final. The final saw Cobras taking on the defending champions Bloem Rebels. Bloem won the toss and decided to field. Restricting Cobras to 146/6/20 seemed to be an easy score for Bloem to chase. Breedt Franco of Cobras batted well scoring 42/35 but was unfortunately stumped from the legside ball which was taken swiftly by Archie Coetzee the Bloem keeper. From this moment trouble started for Cobras batsman. Martin van Wyk of Cobras also fought like a demon with his bowling to try and see his team through taking 2 wickets from 4 overs and only conceding 13 runs. With all the effort it was unfortunate the Cobras couldn't stand the power of Bloem Rebels. Marius Swart again guided his team well by scoring another 50/30. He had also caused the damage with his bowling taking 3 wickets in 4 overs and only conceding 20 runs. Charl Hitchcock baked Marius in the bowling attack taking 2 wickets in 4 overs and only conceding 15 runs. With this superb performance Bloem Rebels retained their championship without conceding any defeat in the tournament winning $ 2 000.00. Well done Bloem Rebels,2015 SA Champs Winners!!!! The tournament also had individual prizes. Marius Swart of Bloem Rebels who scooped the Best batsman of the tournament with Shaun Hickley of Bloem Rebels as well taking the bowling prize. The keeping prize went to Ryan â€˜Jedi' Marsh of On The Field. The plate saw JDK Invaders from Germiston taking on Momentus Invictus from Centurion. Momentum won the toss and chose to bat first putting a score of 146/4/20. Esau Marlin batted well scoring 52/35. Neethling Dean also played a vital part with the ball taking 1 wicket from 4 overs and only conceding 17 runs. All this effort was not good enough though to stop Jdk Invaders from clinching the title. With Deon Dreyer always opening for them he managed to set the tone for his team scoring 50/23. JDK Invaders managed to chase the score in 17.2 overs and only losing 3 wickets. Special mention to Renato Almeida who pulled a muscle in the first round but sacrificed to play all the games through to the finals and bowling well in the final 4/0/12. Well done oom!!!! Also special mention to JDK Invaders for donating R 8 000.00 to our junior leagues in Alexandra Township. Well done JDK Invaders,Plate winners SA Champs 2015!!! We had our hardest game in the ¼ final day against the Jhb Strikers. Strikers posted a very defendable total of 150-6 in 20 overs. When we batted they bowled very well by taking the pace off the ball, we lost an early wicket and then had to re adjust our game plan by just knocking it around and just kept the scoreboard ticking. Bloem Rebels waited for the right time to accelerate and with wickets in hand and a good innings by Marius Swart, Bloem Rebels had the opportunity, Rebels managed to score the runs in the 20th over with only 2 wickets down. Well done to the JHB Strikers we are looking forward to another encounter! After that game our mind set was fixed on winning the tournament and we did so by just doing what Bloem Rebels do best and that is sticking to our game plan. Highlights would definitely be retaining the title and trophy for the 2nd consecutive year in a row, lifting the trophy and seeing Bloem Rebels as a very proud side! At the opening ceremony we said that we are here to defend our trophy with honour, and we did, we also stated it won't be easy to take the title away from us and it wasn't as it won't be next year at the S.A. champs. We as Bloem rebels will defend the title again and we are surely set to do it and aim for three years consecutively and so become the first side to do this. That's our goal. Batsmen of the tournament he got us off to a great start in every innings, he truly deserves the accolade. Well done (m). Ps. Thanks to Bjorn and his team for a well organised tournament it was nice to be crowned champions in a tournament of such calibre well done and a big thanks from Bloem rebels for making us part of it and we will carry the title and trophy with honour . 13 December 2014, all roads led to Last Man Stands T20 Cricket in Port Elizabeth for the South African T20 Championships, as countries 21 finest Last Man Stands cricket teams battled it out for top honours and a chance to win a travel voucher to the Barbados Last Man Stands World Championships, to play cricket in a once in life time destination. Below is a brief review of how the T20 cricket tournament unfolded. 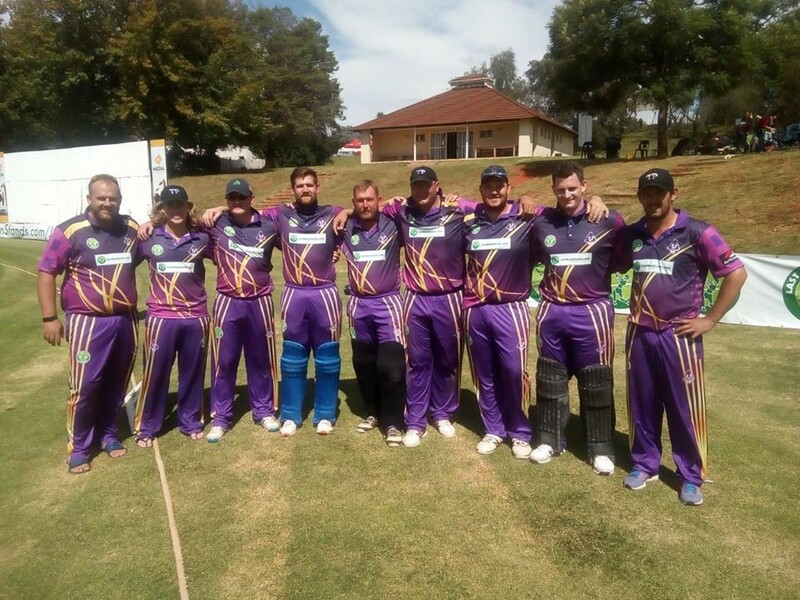 The Joburg Rebels took on the Thunderbats in the opening encounter at Old Grey Oval and won (176-158). Mario Olivier proved to be a fierce competitor with both ball and bat in the hand for he smashed an unbeaten 58 runs from 32 balls, later he then bowled at a lightning speed and claiming wickets, the man just loved to play cricket, and play cricket well! Whilst Johan Pretorius contributed with a brilliant for 50* runs from 21 balls to the Rebels total. Shaun Durant gave a master class performance with a bat scoring 81* from 41 balls for the Thunderbats, but his team were unable to reach the target set. Slugger Red beat the Challengers (200-99) in the opening game at Kemsley Park.Andrew Wells (50* from 21 balls) scored the only half century of the game as most of the batters could manage starts of 20's and 30's but could not go all the way to reach pineapples. 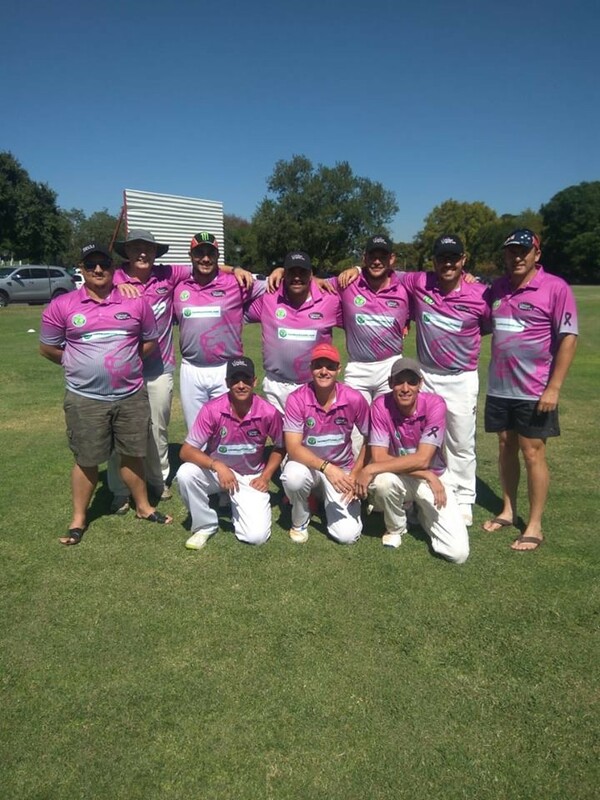 Bloem Scorpions and Dontro Raiders (146-146) were involved in a cracking match up that ended up in a draw at the Victoria Park Pirates Cricket Club. well done to Rob Neal who claimed 3 wickets in the opening day conceding 0nly 17 runs in 4 overs for the Bloem Scorpions and Barnard Berno for scoring 46* runs from 24 balls for the Dontro Raiders. Archie Coetzee (50* runs from 35 balls) and Marius Swart (51* runs from 21 balls) batting at the top of the order helped the Bloem Rebels beat The Dlonra Warriors (121-119) in 14.2 overs and with that claiming the first bonus points of the tournament. On The Field showed some brilliant team work to beat Shield Dontro Vikings (92-91) in 9.1 overs and with that they too earned a bonus point in their opening game. Dale September's bowling spell was superb for he took 4 wickets for 14 runs in 3 overs - the man can play cricket! Batters could not reach the elusive 50 run mark because of the target they were chasing, Wes Briggs (40* runs from 20 balls) and Stephen Papale (46* runs from 24 balls), carried the team over the line with the bat. 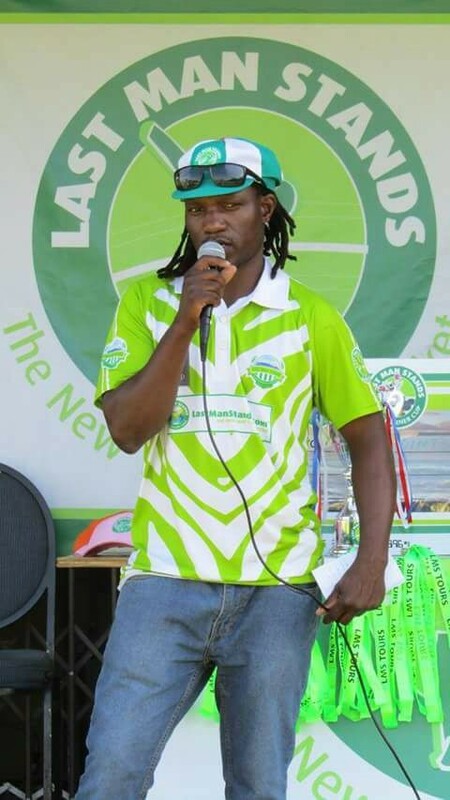 Pieta Olivier manufactured a lovely and unbeaten 50 runs from 41 balls for the Vaal Dragons and helped them reach a target of 123 runs in 20 overs. Guan Dreyer smashed 50* from 19 balls and Wimpie Voges scored 51* runs from 45 balls as Razed by Squirrels beat The Vaal Dragons (129-123). Bloem Scorpions were determined to put the record straight in their second encounter and beat the Bengole Tigers (109-105) in 11.3 overs. Duane Stones produced a match winning bowling spell of 5 wickets for 13 runs in 4 overs to help his team limit the Bengole Tigers to a fairly low score. Werner Hugo raced to 50* runs in quickly to help his team seal the deal. The Slugger Black beat the BenchWarmers (173-73) in a truly one sided affair. Glen Bester played a variety of cricketing shots. He was keen to cut, eager to pull and was always comfortable on the front foot driving through the line as he posted a personal score of 50* from 39 balls. Even though the BenchWarmers lost the contest, Tyron Lewis took 2 beautiful catches from as a keeper then he produced an excellent bowling spell of 4 for 23 in 4 overs. A splended 49 not out from 36 balls from the evergreen cricketer Bobby Rug as Got_cha lost to The Joburg Strikers (122-155) in a match that could have gone either way. 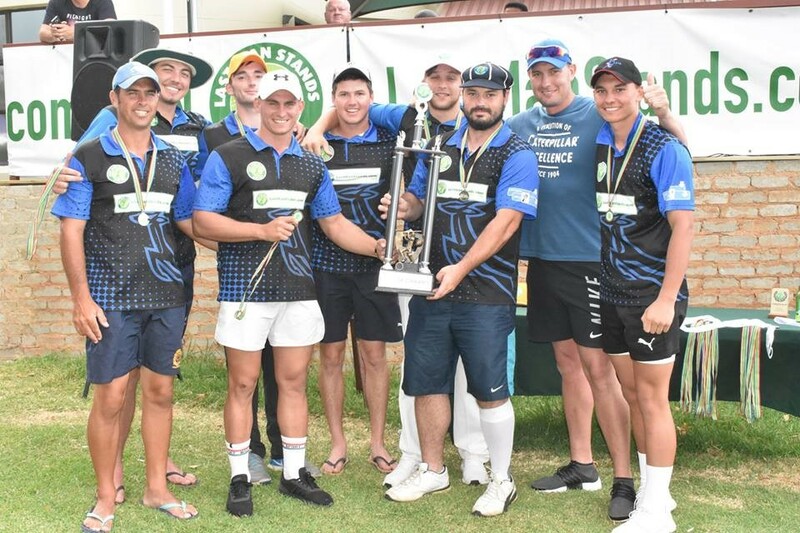 The Joburg Strikers had one advantage on the day and that was a brilliant individual cricket performance from Reinier Wiessener for he smashed a match winning 51* from 39 balls as his team claimed victory. The Wyobi Wicket Warriors outplayed The Challengers (208-66) in all departments of the game and won the Game comfortably by almost 150 runs. Justin van der Merweopened the batting and set the tone from early on, helping his team to a 10 run per over run rate from the onset, scoring 75 not out from 45 balls. Even though Ilone Chetty bowled a tight line for the Challengers as he took 4 wickets for 26 in 4 overs,Devan Oxley-Oxland smashed an unbeaten 51 from 20 overs at the back end of the innings. The amazing cricket, Devon Oxley-Oxland, bowled his team to a superb victory with magnificient left arm swing picking 3 for 6 runs in 4 overs. Andries Huisamen scored 52* runs from 23 balls at the top of the batting order to help his team, The Brits Rebels crush Slugger Red (184-134). Neil Norval also had a brilliant time behind as the sticks as he claimed 3 dismissals of 2 stumpings and a catch for the victors. Shaun Terblanche provided some resistance for the Slugger Red as he scored the highest individual total for his team at 32 of 16 balls before he was run out. The Dontro Raiders lost to the JDK Invaders (120-123) in a fairly even contest. Francois van Rensburg scored 53* runs from 36 balls first up and helped the Raiders reach a healthy score after 20 overs. It was Andre Kriel's 53* from 30 balls for the Invaders that made sure his team bagged the winning points. Special mention goes to Ryan Marshfor a special bowling spell of 4 overs, 5 wickets conceding only 14 runs. On The Field collected maximum points again as the beat the Joburg Rebels (132-88) in a match were Stephen Papale emerged as On The Field's hero with a knock of 40* from 28 balls, to carry his team over the winning line. Alex Nel produced one of those spells that batters found it impossible to play shots, the ball swung and bounce off a length and come on to the bat sooner than anticipated, picking 3 wickets in 3.1 overs conceding 13 runs. Wes Briggs received a ball from the Joburg Rebels speed star, Mario Olivier, which misbehaved of the pitch and kept low. He was trapped leg before wicket on 32 of 17 balls. The Wyobi Wicket Warriors beat the Brits Rebels (204-157). This was the second game of the day they had managed to blast their way to over 200 runs in 20 overs, thanks to the brilliant Justin van der Merwe who managed to score yet another 76 runs, this time off 28 balls. He was support very well by the hard hitting Esau Romano who smashed 50* from 20 balls. (40-44) to the JDK Invaders. Andre Kriel then smashed 37 runs from 12 balls for the victors as they claimed a bonus point. Day two was fantastic, with bright blue skies, less wind producing conducive and perfect weather conditions at the coastal town of Port Elizabeth as The Benchwarmers took on The Bloem Rebels and lost (122-123). Tyron Lewis contributed with the bat this time around scoring 48 runs but Marius Swart denied him the opportunity to reach half a century. He gave him a perfect yorker that uprooted his middle stump. The ever reliable Archie Coetzee scored another unbeaten 50 from the top of the batting order and he was backed up by Jason Whittemore who chipped in with a lovely 41 runs to guarantee the Bloem Rebels victory. The Thunder Bats came back with an intent to win all their remaining games. They beat the Shield Dontro Raiders (210-160) in an emphatic win to keep their hopes of staying in the tournament alive. Werner Bronkhort (56* from 22 balls), Shaun Durant(51* from 25 balls) and Werner Lombard's (51* from 27 balls) scores were a perfect ingredient to set a massive target for the opposition team. Kyle Jacobs responded with a very good 52 not out from 32 balls and Wikus Jansen van Vuuren's 52* from 32 balls assisted the Shield Dontro Vikings reach a respectable total but the game was already out of their reach. Razed by Squirrels beat Got_Cha (164-139). Guan Dreyer had a fantastic time in the middle, he struck the ball cleanly and consistently found the gap to the boundary, scoring an unbeaten 50 runs from 25 balls. Colin Williams also enjoyed a bit of his top form for the first time in the tournament as he struck a clean 50 not out for the winning team. Michael Langlois (52 runs from 34 balls) and Bobby Rugg's (48* from 51 balls) counter attack was excellent but their effort was not enough to win the game for Got_Cha. John Mare struck the ball effortlessly for 7 boundaries and a couple of singles as he race to a brilliant pineapple. Stefan Gericke (4 overs/ 5 wickets/ 18 runs) then single handedly bowled the Brits Rebels to an unbelievable victory over The Challengers (171-156). 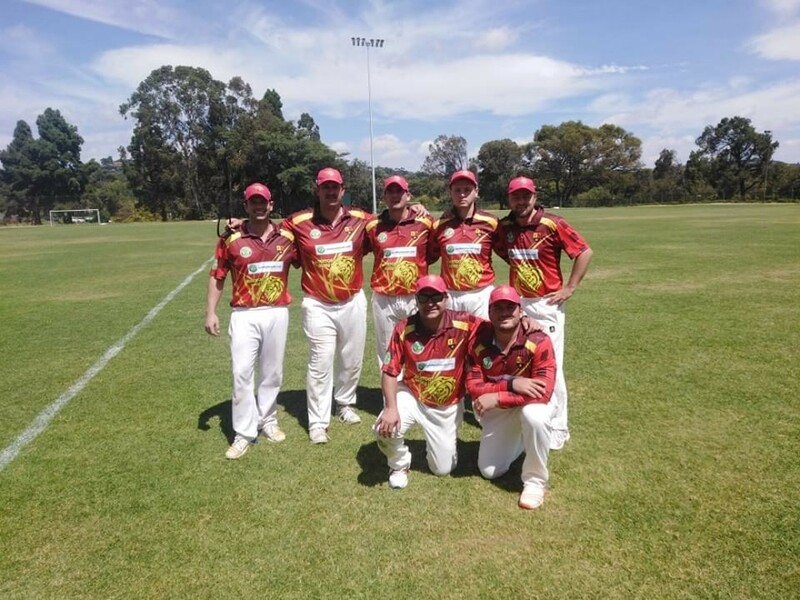 Wyobi Wicket Warriors continued with their winning streak as they beat The Slugger Red (169-137) in a match The Slugger Red needed to win to stay in the main tournament. Shaun Terblanche smashed a solid 58* runs from 34 balls but his team mates were undone by the consistent left arm fast bowling of Devan Oxley-Oxlandwho took 3 wickets for 18 runs in 4 overs. Stefan Divan Barkhuizen smashed 53* from 29 balls and the hard hitting Esau Romanoraced to an unbeaten 51 runs from 28 balls nailing the final nails in the Slugger Red's coffin. Francois Kleynhans was on top of his batting game in this tournament. He managed to reach another 51* runs from 29 balls comfortably helping the Joburg Strikers overcome The Vaal Dragons (133-117). Jannie Penns scored a magnificent 51* runs from 37 balls, after he had bowled a fierce bowling spell of very fast bowling, but the game was already lost by his team. On The Field beat the Thunderbats (147-114) in the own back yard as Wes Briggs (50* from 29 balls) continued his onslaught against the tournaments bowlers. Dale September was unfortunate to be trapped Leg Before Wickets on 47 runs and the tournaments most experienced player, Clint de Bruyn claimed 3 sticks with his off spins for 25 runs in 4 overs in the middle period. Alex Nel then cleaned the tail enders up, ending with impressive figures of 2 wickets for 9 runs in 4 overs. The Bloem Scorpions lost a match they needed to win against the relentless JDK Invaders (117-129) to stay in the run for the ultimate prize. Theo Smit (50* from 21 balls) and Francois van Rensburg (53* from 40 balls) scored quick runs from the top of the order to guarantee a win for The Dontro Warriors against the struggling Bengole Tigers (130-134). Slugger Black beat the Bloem Rebels (162-169) thanks to a brilliant piece of batting from Brian Upman who played an inning that was easy on the eye, scoring 58 not out from 30 balls he had faced and Michael Gilchrist added with a valuable 41 runs from 27 balls batting at 8 for his team. The Joburg Strikers beat Razed by Squirrels (119-118) eliminating them from the main tournament. It was a low scoring game as both teams played steadily and carefully trying to accumulate runs by taking quick singles to reduce the risk factor associated with hitting sixes. Got_Cha beat the Vaal Dragons (135-134) in their last elimination game. Mario Olivierwas yet again the biggest threat for Got_Cha with his pace,swing and bounce on a pitch that was unpredictable, claiming 3 wickets for 18 runs in his allocated 4 overs.Morne Carlson and Micheal Mackie were superb with the bat as they both posted unbeaten 50* for less than 40 balls respectively for the Vaal Dragons but the game was already lost. The Bloem Rebels narrowly beat Razed by Squirrels (150-149). Tiaan Dreyer's batting innings was a display of exceptional brilliance as he scored 50* runs from 26 balls for Razed by Squirrels. It was Archie Coetzee of the Bleom Rebels who stole the show once more as he struck a spectacular and unbeaten 52 runs from 30 balls and carried his team over the finishing line for victory. He was supported very well by Marius Swart who added 46 valuable runs from 23 balls he had faced. Shield Dontro Raiders lost to The Joburg Strikers (148-91) in a fairly one sided cricketing affair. Renier Wiessener smashed an impressive and yet again an unbeaten 50 runs from 27 balls batting at the top of the order. Philip Crouse made sure his team, the Joburg Strikers, did not lose any momentum when they were batting at the back end of their batting inning. With the field spread out to stop the boundaries, he muscled a few boundaries over mid-wicket and struck an unbeaten 50 run from 30 balls with relative ease. Welmus Buchner (31 runs from 50 balls) provided some resistance for Dontro Raiders as he reach the highest individual score in his team. Alexandra Township Chiefs were no match for the organised Bloem Scorpions and lost (111-113). Duane Stone showed his class as he played elegant shots with pure furnace to reach a magnificent 50 not out from 30 balls. His team were happy with the result and advanced further in the competition. The clash of the giants, as two tournament favourites met to knock each other out of the race. The Wyobi Wicket Warriors might feel they were unlucky to lose to the Bloem Rebels (121-133), for they felt they had a chance to win. The game was so closely contested that no batsman managed to score a pineapple and the bowlers could get get wickets. Jordaan Hentus scored a beautiful half a century (50* runs from 31 balls) for the galvanised Bloem Scorpions to help them reach a good score even though Hennie Kruger had destroyed most of the batting line up to take 4 wickets for 16 in 4 overs. Werner Hugo also bowled an incredible winning spell of 3 wickets for 18 runs in 4 overs but On The Field were simply too good on the day. Their amazing team work and determination saw them through and On The Field beat Bloem Scorpions (134-131) to book a spot in the tournament's semi finals. Semi final day and On the Field took on the The Slugger Black at their own back yard at Old Grey Oval. The Sluggers won the toss and elected to bat. Stephen Papale obliged, producing a fantastic bowling spell of 4 wickets for 23 runs in 4 overs. The Slugger top batting order crumbled and posted a disappointing low score of 110. Wes Briggs got his team to a lively start scoring an unbeaten 50* runs from 34 balls as On The Field cruised to a comfortable win over The Slugger black (111-110) and booked the first pot in the finals. Bloem Rebels had previously beaten the Joburg Rebels (136-135) in a semi final clash to book the last spot in the finals against On The Field. The tournament's final match was between The Bloem Rebels who beat On The Field (132-131). It was an exciting game as the best teams in the tournament faced each other. Beautiful cricket was on exhibition and the spectators were entertained by bothMarius Swart (43* runs from 23 balls) and Wes Briggs (36 runs from 20 balls). The fielding was top class from both teams teams, the batting was outstanding and the comradery was exceptional. TeamKit.co.za SA Champs proved to be an extremely popular event, with large crowds coming into the illustrious suburb of Houghton, less than 50 metres from where the former State President, Nelson Mandela recently passed away in his Houghton home. The Madiba magic was evident at the tournament and in all teams participating; with camaraderie between the teams not seen before. All teams participating wore black arm bands during the tournament in honour of the great man. There were 20 teams participating in the event and special thanks must go to all the team organisers for helping us make it happen. Special mention must go to Kurt who led his team hailing all the way from PE and Arthur who led his team from Bloemfontein. Special mention must also go to two time champions Rebels, who were playing in their record 4th straight Teamkit.co.za SA Champs in a row! All though they did not go on to win the tournament, they held their heads high, and made it all the way to the semi-finals. They have also played in the last two World Champs, Cape Town and London where they represented South Africa Proudly. The Rebels lost to WWW in an extremely tight game needing 18 off the last over and a Home Run off the last ball to tie the game, but it was not to be their time. WWW have always been an exceptionally good bowling unit, and with Stephan Barkhuizen, this was to be expected! The other semi-final was between Kings VIII (current SA Champs, and playing in their 3rd SA Champs) and Green Mambas. Green Mambas bowled extremely well, but let it slip in the last ¼ of the game when Kings VIII kicked it up a notch with some big hitting from ZP Hansmeyer and the 2012 World Champs player of the tournament George Wolhuter, who took Kings VIII to 178 after 20 overs. This total proved too much for the Mambas and they were bowled out for 89 in the 17th over! WWW batted first, and made a solid start with Justin van der Merwe hitting a brilliant 50! Unfortunately, the rest of the team battled against the disciplined bowling of the Kings VIII as well as the pace of Mario Olivier who turned it up a notch for the final! WWW went on to make 130 a total they had been defending all tournament! However it was not to be as Renier Groenwald, James Nelson and Mario Olivier took Kings VIII to the total in the 18th over losing just the one wicket of Renier! One by one they fell at the hands (and sheer class) of the World and now TeamKit SA Champs KINGS VIII. This years tournament culminated in what many would term a â€œdream finalâ€ with the much fancied centurion outfit matched against the (then) current and two time Champions from Johannesburg, Rebels. CHECK OUT THIS VIDEO CLIP FOR SOME CLASSIC PHOTOS OF THE DAY'S ACTION! Rebels won the toss and elected to bat. Their opening pair built a decent platform, but none of the duo were able to really press on and make telling scores. This was further compounded by the demise of their next duo in quick succession. Alex Nel (5) came in and delivered a few lusty blows helped by Nicholas Hyslop (5) but by then it was a little too late. Rebels ended with a score of 148 from their allotted overs, which was a decent total but one always felt that they were 20-30 runs shy of a competitive total. KINGS VIII showed their class when coming out to bat, they made light work of it getting their target in 16.2 overs, largely thanks to a ferocious knock from their man of the moment George Wolhuter (2) whose 50 came from a mere 18 balls, the second fastest 50 of the tournament. The business end of the tournament began with last 16 encounters on Sunday morning, followed by the quarter finals soon after. There were a few notable and â€œsurpriseâ€ results as this meant the end of the road for all but four teams. The young side from Durban, Futura Sports Agency, impressed in their last 16 encounter match against Alberton Black Mambas. The Muffin Men were once again found wanting by Team Blazers during knock outs. However it was the late game which saw what many might call a shock, On the Field being knocked out by the Centurion team, Knights thanks to a Home Run! Johannesburg Proteas were undoubtedly this years surprise package, having finished second in their group they went on to comfortably defeat To Be Confirmed and Counter Strikers in the last 16 and quarter finals respectively. Even as they lost out to the eventual winners, they put on a great performance as the KINGS VIII batting reply was nervous at best. It comes as no surprise then that 3 of their players made the dream team! Despite their loss in the finals the Rebels dominate the dream team with no less than 4 of their players making the list of the best 8 players. WELL DONE TO KINGS VIII AND GOOD LUCK TO THEM NEXT YEAR AT THE WORLD CHAMPS IN ENGLAND!!! The TeamKit.co.za SA Champs league in South Africa had it all in the 2010 edition! T20 cricket reached new heights with explosive bowling, batting, fielding! The Last Man Stands rule coming into play in the final game that saw nemesis needing 9 runs to win with three overs to go. Franco was eventually caught on the boundary by Adriaan Janse van Rensburg who held on to an absolute blinder, under fading light and immense pressure. The 1st three batsmen from Rasta Rebels surprisingly went in quick succession (as they previously set impressive platforms for the team). The ship was steadied by Werner Pretorious who made 24 off 25 balls before being caught after 10 overs. Nicholas "Wilbur" Hyslop then battled hard with a string of different partners for his 19 off 21 balls. Grant Hutch came in a looked like he was going to unleash some fury hitting a massive 6 off Franko Botes. Franko Botes however had the last laugh as the next over he was bowled by James Leach. Dirk Naude was the Last Man Standing and scored an invaluable 10 runs off 16 balls. The bowling and fielding of Nemesis was extremely tight never giving an inch with only a couple extras being given away during the innigs. Pick of the bowlers were Bernardus(Nando's) van der Spuy and Andre vd Berg who both went for around three an over. After bowling out Rasta Rebels, for 99 the game was always in Nemesis hands. The opening pair from Nemesis ( Andre vd Berg (1) and Bernardus van der Spuy (2)) put on a solid start before Andre was bowled for 11 off 7. Bernardus played a long thoughtfull innings and after 10 overs had placed Nemeis in a commanding position. A few wickets fell around him, as the track began to deteriorate, and the Rasta's got their fielding going with Wes Briggs taking a solid catch at point. He eventually fell scoring an impressive 44 off 33 balls to another blinder of a catch by Tiaan! Once he was gone the wickets began to tumble and the tension mounted for both teams, as realisation dawned that both teams were suddenly neck in neck for the title!Franko Botes had all to do as Last Man Stands. He played a few superb cover drives pinching two from a nervous fielding team. He then hit a boundary in the 16th over taking Nemeis with in 9 runs of victory. Surely they could not lose from here. Then a dot ball, 15.3 overs gone. It was slightly short down the leg, Franko Botes went for the big one and was caught by Adriaan . The Rasta's bowled came into their own in the 2nd 10 overs, and Tiaan Bekker was superbly backed up by Grant Hucth, Dirk Naude, Wes Briggs and Werner Pretorious. Tiaan probably man of the match for his figures of 4 overs for 6 runs with 3 wickets! Well played to both teams in the final, and all teams in the tournament! 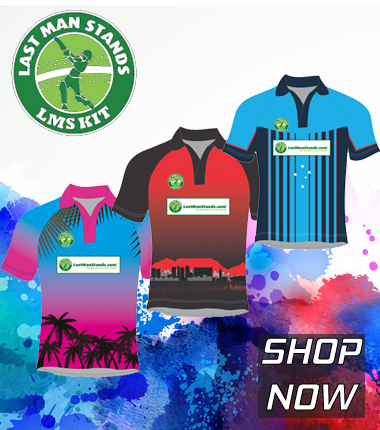 The LMS FairPlay Standard was kept well and truly alive even under the tense competition! Good luck to the Rasta Rebels at the World Champs in Australia later this year.